Time Machine makes multiple copies of your Mac files, so you can see what a file or folder looked like on the day it was backed up. If you know that the particular item you’re looking for used to reside in a given folder on your Mac, open that window before embarking on your journey or enter its name in the search box in the Finder window. Next, click the Time Machine dock icon, and your current desktop slides out of view. 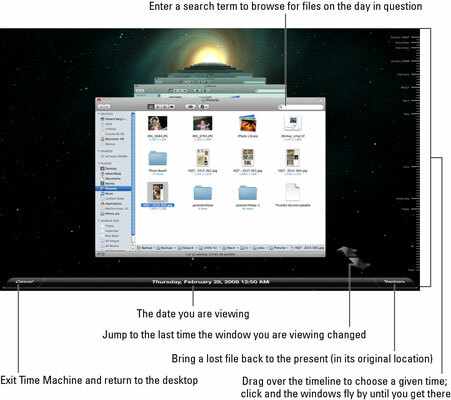 You and whichever Finder-like window was open at the time you clicked the icon are now floating in space, as shown in the figure. You can now look for the lost or altered file. Say that you unintentionally wiped out a critical document several weeks ago that you now hope to recover. Use the timeline along the right edge of the screen or the navigational arrows toward the bottom right to go back to the time you deleted the file. When you click, the windows fly forward or backward for a second or two until landing on the chosen day. If you don’t immediately uncover the lost file, try typing its name again in the Finder search box. You’re searching for the file on that particular date. When you encounter the wayward file, highlight it and click Restore. It’s transported back to the present, with Time Machine conveniently dropping the file in its original location. Click Cancel to return to the present. If the main hard drive on your Mac fails, you can use Time Machine to restore your entire computer. Just insert the Leopard Install or restore DVD that came with your Mac, and select Restore from Time Machine. You’ll have an option to choose the date from which you want to restore your system. You can also use Time Machine to transfer important settings, applications, and files to another Mac. Open Migration Assistant (in the Utilities folder under Applications) and choose From a Time Machine Backup when asked how you would like to transfer your information. A couple of security notes: You can make sure a given file is not backed up by highlighting it in Time Machine, clicking the Action icon in the Finder window, and then choosing Delete All Backups of the file in question. And if you encrypted the files in FileVault, they remain encrypted as part of your Time Machine backup, so you’ll need a password to open them.